After spending far too many nights benchmarking, let’s take a look at the first of three ATA RAID adapters. The Adaptec AAA-UDMA was the first RAID 5 adapter designed for ATA hard drives. RAID had been the domain of SCSI hard drives until 1995 when Promise released the FastTrak, a RAID 0, 1 and 0+1 ATA33 adapter. Since then quite a few companies, Promise, Highpoint and AMI to name a few, have released ATA RAID adapters in the same vein. 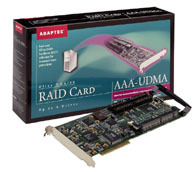 It took a leader in SCSI to release the first RAID 5 adapter, and so Adaptec made the AAA-UDMA. This leads us to the first problem: Adaptec is a SCSI company, and that’s what it knows. Therefore the AAA-UDMA is based on their line of SCSI RAID adapters, right down to the BIOS. In fact Adaptec has taken one of their RAID cards, added an ATA controller chip, and created the AAA-UDMA. The card translates SCSI commands to the ATA chip and in one stroke limits it’s ability to be a contender. Let’s take a step back and look at the whole picture. Opening the box reveals a full length PCI adapter, two manuals, four drive cables, one CD and a slew of diskettes. If you’ve never worked with full length PCI cards, be prepared for a surprise; they run the entire case and take advantage of those slot brackets by the case fan you’ve never used. The AAA-UDMA is 12.28 inches long. Examining the card shows four IDE connectors and an IDE LED connector. There is a 168 pin DIMM slot with a 2 MB ECC EDO RAM DIMM installed; why they chose EDO over SDRAM I’ll never know, but I would have liked to try a 64MB SDRAM DIMM in there to see what’s what. I put a 64MB PC100 SDRAM DIMM on the card just to see, but it gave me an error of unrecognized DIMM. Of note as well are the controller chips: standard Adaptec AIC-7890AB and an AIC-7815G. These are used on Adaptec’s SCSI RAID controllers and a sure tip off that this is a SCSI design cobbled with IDE components. The UDMA translator is an Altera Flex, which is my first experience with this company and perusing the web site didn’t give me much insight. This card is over a year old and uses ATA66 connections, giving a maximum transfer rate per channel of 66 MB/s burst speed. Installation was quick and easy: plug the card in and reboot. If you want to boot from the array and install an operating system, a configuration boot disk is provided for most network OS’s utilizing Adaptec’s ArrayConfig utility. I was using a single disk as the boot disk and the RAID array as separate storage, so once into Windows 2000 the hardware was detected and I used the diskette to load the drivers. Up and running. I shut down, hooked up the drives and rebooted. Unlike other ATA RAID controllers, going into the card’s BIOS doesn’t let you configure anything. It’s Adaptec’s standard SCSI BIOS and let’s you low level format the drives, but that’s about it for ATA drives. All drive, adapter and array configuration and management is done through software, namely Adaptec CI/O Management. This package is installed from the single CD and has a thick manual dedicated to it. CI/O is used manage all Adaptec arrays, ATA or SCSI, and is easy to work with. The software serves two main functions: to set up arrays and to monitor all related equipment, locally or remotely via a client PC on the network. Once I had everything installed I selected set up my first array, a four disk RAID 0 configuration. CI/O walked me through the process and led me to the last step: initialization. This took over four hours for most configurations using four 20 GB Maxtor drives; better safe than sorry. Quite a few options are presented for RAID configurations: RAID 0, 1, 0+1, 5 with block sizes in kilobytes of 8, 16, 32, 64 and 128. 64 is the default setting, as it is with all ATA RAID adapters I’ve looked at. As well you can have just disks connected to the card, but it would be a lot cheaper to buy a Promise Ultra adapter if you were just looking to add two more IDE channels. Adaptec CI/O Management is designed for just that. All aspects of the array, drives and controller are monitored and reported through CI/O or NT’s Event Viewer. I found my way around without consulting the manual and was able to accomplish most tasks easily. Everything is well laid out and logical; a minor problem was that each task opened a new window within the software. Remote management is done by installing the CI/O software and pointing it to the Adaptec array; performance over the network was good and I managed everything the same as on the machine with the card installed. Consulting the manual showed the full depth of features developed by Adaptec for their SCSI RAID controllers, pointing out time and time again that advanced features weren’t available for the AAA-UDMA. I recommend reading through everything before deploying in a production machine, but that’s safe advice for any hardware upgrade. Consulting the benchmarks show what a few other reviewers have discovered: this card isn’t built for speed. Adaptec bills the AAA-UDMA on their RAID site as a “sub-entry server” model. Apparently that’s reliable but slow. To wrap it all up, I would have to recommend that most users pass on this model. If you need ATA RAID 5, go for the Promise SuperTrak line. If your environment is using Adaptec SCSI RAID controllers and CI/O Management, then the AAA-UDMA would fit right in. Editors note: this review was migrated from the old eBabble.net site and the photos updated. Originally published January 10th 2001.